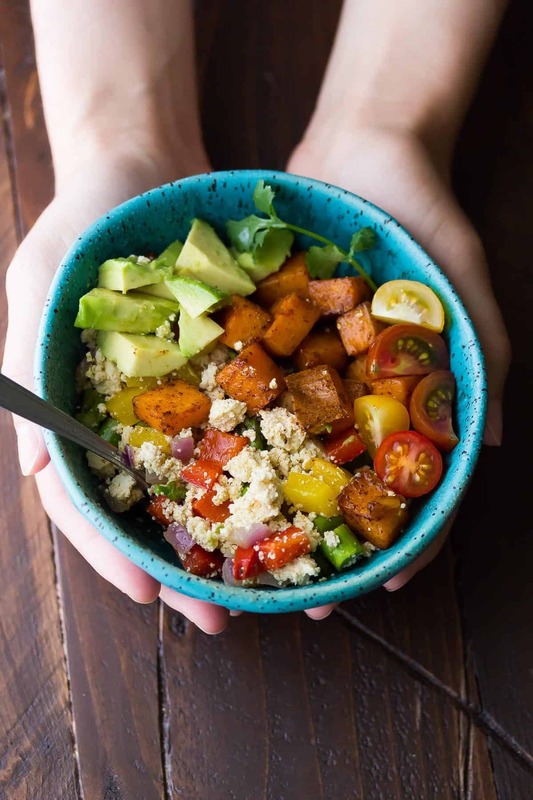 This tofu scramble and breakfast sweet potatoes is a healthy, make-ahead breakfast bowl recipe that will actually keep you full! I knew it had been awhile since I shared a make ahead breakfast recipe with you all, and when I went to check it was even longer than I had thought. Not since these healthy breakfast burritos with zucchini & lentils waaay back in March! Much as I’d like to tell you all that I’ve mastered breakfast by using the delicious make-ahead breakfast recipes that I’ve shared before, but sadly, breakfast is still a challenge for me. 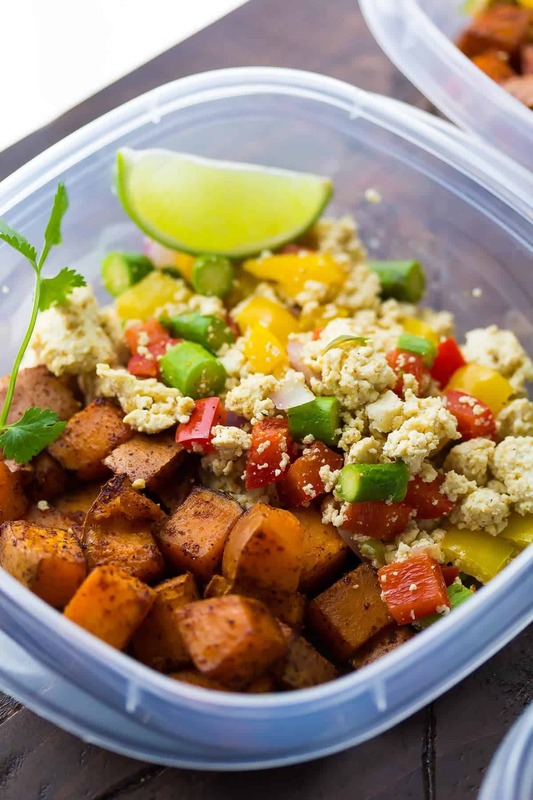 So to liven my routine up and try something new, I created these healthy breakfast bowls filled with a veggie-laden tofu scramble and savory breakfast sweet potatoes. And: YUM! Tofu is definitely NOT on my list of food loves. I don’t know. Any tofu recipes I’ve tried in the past ended up flavorless, and the tofu had a rubbery, not so tasty texture. That’s why I was pleasantly surprised by this tofu scramble. The tofu is broken up into small, manageable chunks that are *kind* of similar to eggs in texture. I added plenty of veggies and spices that liven up the flavor. And I’ve finally found a tofu recipe that I love! 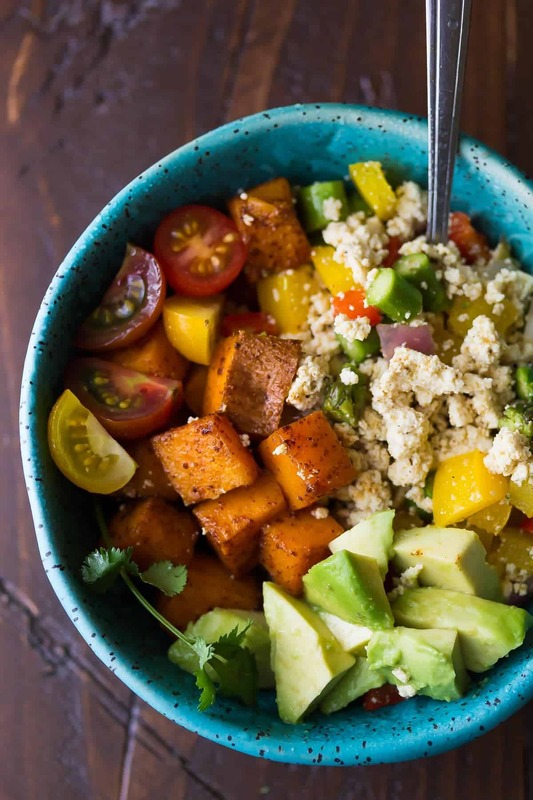 It has plenty of flavor, a great texture, and served with these breakfast sweet potatoes and a dollop of Greek yogurt (or even better: avocado and cherry tomatoes), and you have yourself a healthy, delicious breakfast bowl that is actually going to keep you full! I’m just going to be honest with you guys: the HIGHLIGHT of these breakfast bowls is the sweet potatoes. They are sweet, savory, so creamy and the perfect compliment to the tofu scramble. No skipping them, OK? It is SO nice to have one less thing to worry about in the morning. Just pull out your breakfast bowl, re-heat it in the microwave, and top with something creamy. Suggestions: Greek yogurt, avocado, or some cherry tomatoes. So you can focus on more important things. Like coffee! Toss sweet potatoes with olive oil, chili powder and salt. Arrange on a baking sheet (or two if they won't fit), and bake for 15 minutes. Stir up and bake for another 15-20 minutes, until cooked through. While sweet potatoes bake, prepare the tofu scramble: Mash the tofu with a potato masher until it is broken into small chunks. Heat oil in a large non-stick pan. 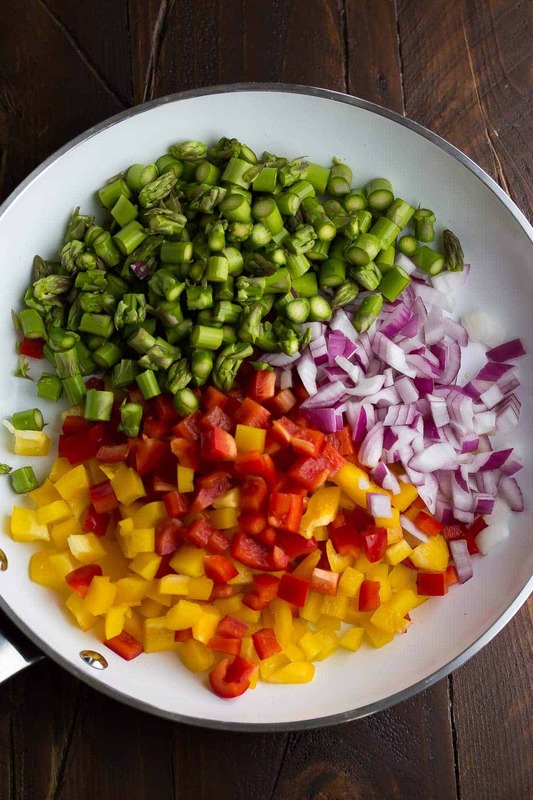 Add the onion, bell peppers and asparagus, and cook for 5 or so minutes, until soft. Add the cumin, ground coriander, salt, pepper, and tofu. Cook for 2-3 more minutes, until completely combined. 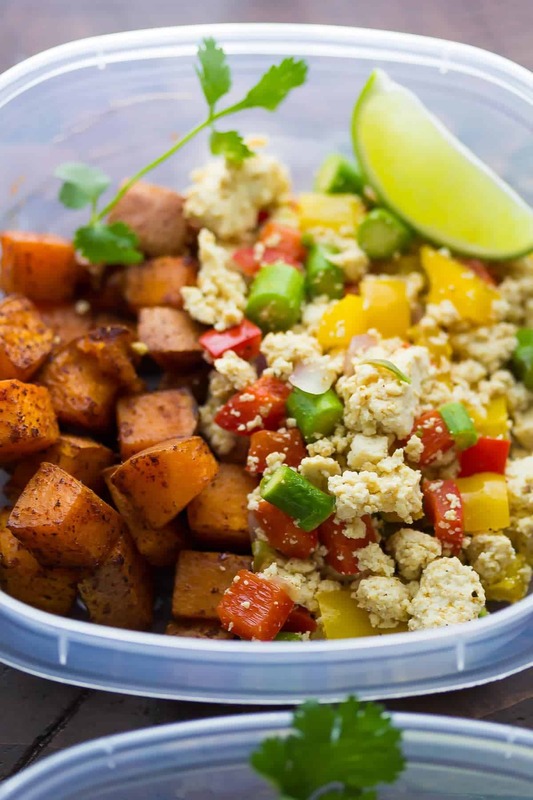 To assemble the breakfast bowls:Divide the tofu scramble and breakfast sweet potatoes amongst 6-8 containers. Store for up to 4 days in the fridge. To serve:Heat on medium in the microwave for 1 minute or until heated through. Top with fresh cherry tomatoes, avocado, and/or Greek yogurt. What are the health facts like serving size, fats, carbs, sugars, and protein? 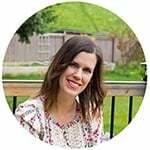 Hi Vanessa, I unfortunately don’t have this information, but it’s something I’m hoping to add to my site this year. this looks amazing, I can happily eat anything with sweet potatoes in it so pass me the bowl please!! This is EXACTLY how I want my Tues morning breakfast to look like!! I’ve never actually tried a tofu scramble before, but I don’t even know what’s holding me back because this looks AMAZING, Denise! I’m ashamed to admit that I’ve never tried a tofu scramble before. This recipe is making me want to! I love all of the colors and flavors!! I need all of the make-ahead dishes I can get my hands on! I’m not the best when it comes to breakfast, as I usually just grab yogurt and coffee, so this looks perfect. I love that you used tofu in here, too! Looks like a smart and healthy make-ahead. I was wondering whether you just haven’t found the right brand of tofu to really like it, keep experimenting! You use extra-firm tofu here which is usually a good bet for a stir-fry or similar. Breakfast is a little bit of a challenge for me too, I tend to just grab something easy as I’m heading out the door. I haven’t tried a tofu scramble yet, but I love the idea. 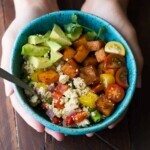 These bowls look so delicious with those sweet potatoes too! Sweet potatoes are pretty much always the highlight of a meal for me!! haha These bowls look fantastic! And make-ahead? Even better! This scramble looks delicious! I am loving those breakfast sweet potatoes too!